"Sher said ... I've been there. But you were lucky to have a train come through that day. Now in the last picture, if you continue down along side the tracks (along the river) you will come across a small man made dam. 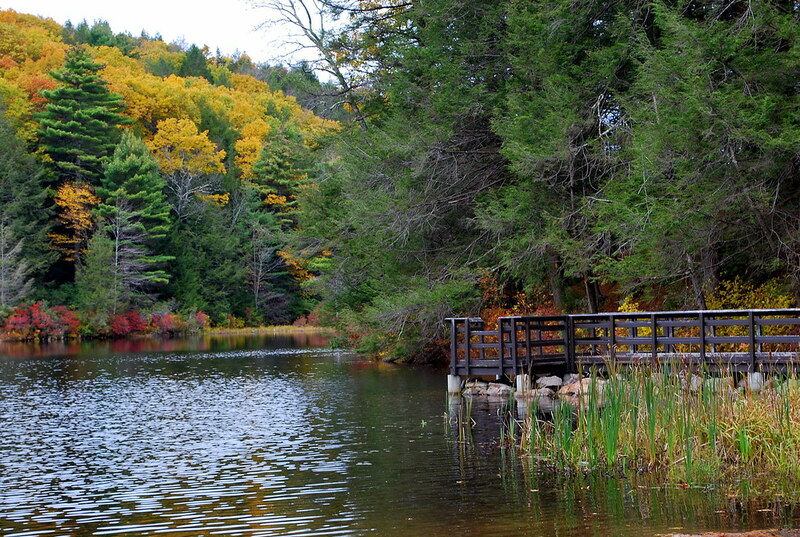 It's an interesting area to hike." Sher is absolutely right that there is, in fact, a small dam in the area of the Taft Tunnel which is appropriately named the Tunnel Dam and is located just a bit south of the railroad tunnel itself. The dam is quite interesting in that it's an L-shaped dam - something I hadn't seen before I came across it last April, the first time I went exploring the Taft Tunnel. The dam is obviously used by Norwich Public Utilities as there's a power station located right next to it on the Norwich side of the Quinebaug River but I couldn't seem to find any information on their website in regards to it so honestly have no idea how old the Tunnel Dam is or much of anything else. Sometimes you can dig up all sorts of good stuff with a web search and sometimes you get nothing ... this is one of those cases! 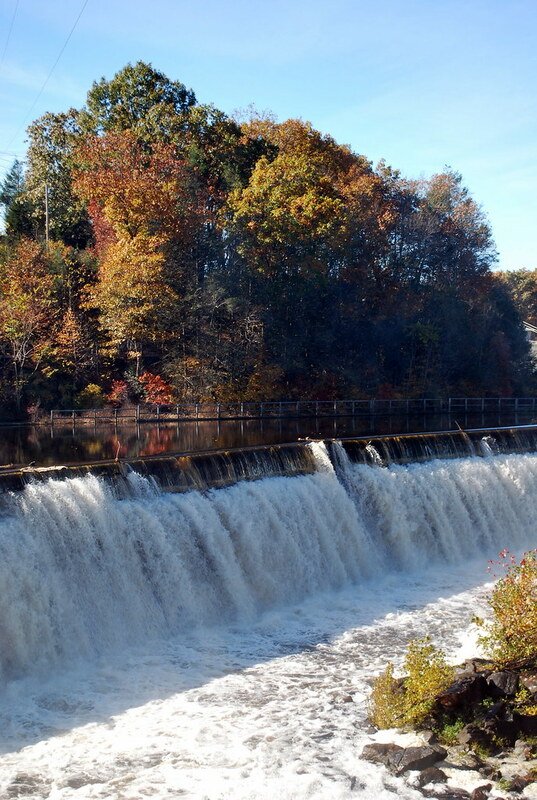 One thing I do know, though, is that there is a fish lift located on the dam just as there is one on the Greeneville Dam and a fish ladder on both the Taftville Dam and Occum Dam. 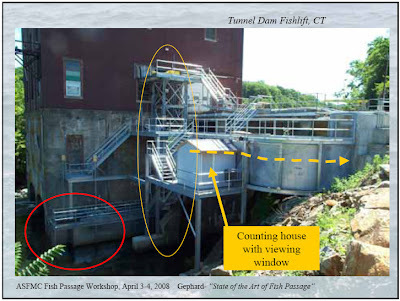 The picture above of the Tunnel Dam fish lift comes courtesy of the Atlantic States Marine Fisheries Commission and their paper on Fish Passage Issues Impacting Atlantic Coast States presented at a workshop on April 3rd & 4th, 2008 in Florida. The 260-page paper is somewhat daunting and technical when it comes to fish lifts and ladders and the such but I got a pretty good idea of what they were all about and how important they are. After all, fish can't very well go jumping up and over the dams that are put on rivers and they need some way to be able to get upstream to spawn or their numbers will die out, right? 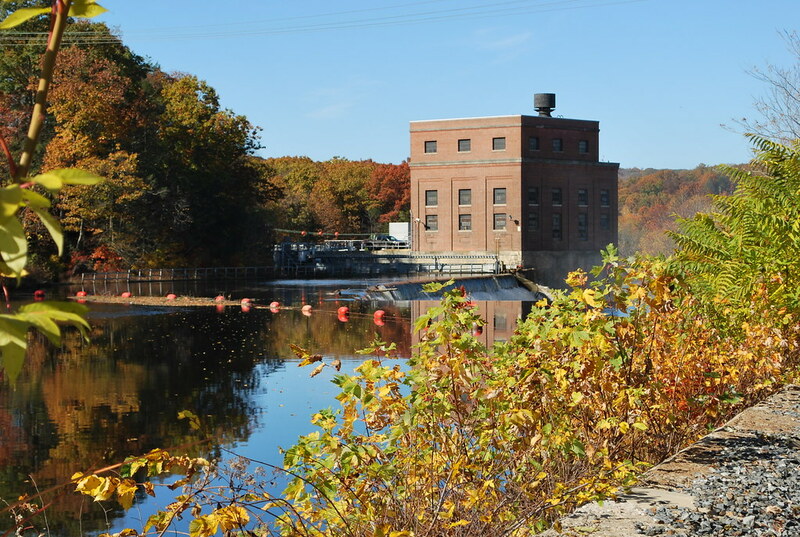 Norwich Public Utilities offers tours of the fish lift at the Greeneville Dam in the spring, something I'm going to try to remember come next May so I can check it out and most likely take lots of pictures! 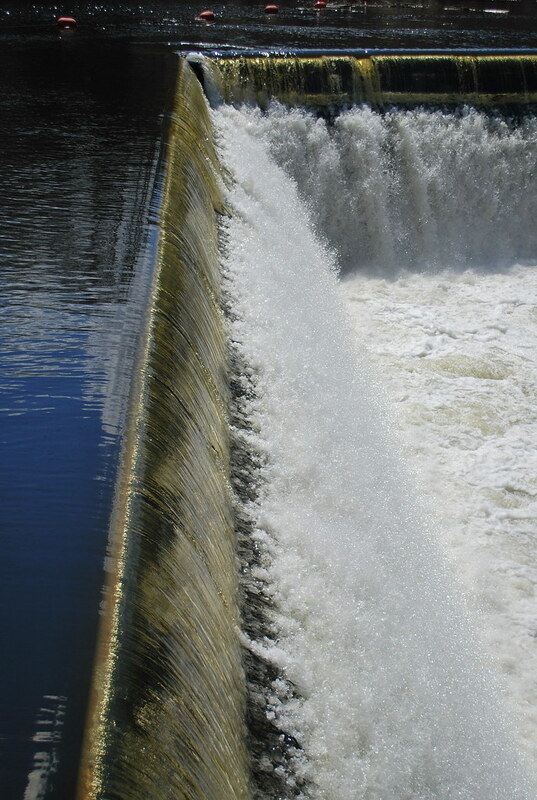 In the meantime, here are a couple more pictures of the Tunnel Dam which was running pretty good on Monday after all of the rain that we got last weekend. I'll be showing you some more dam pictures I took soon but for now, everyone have a great Saturday and a Happy Halloween! 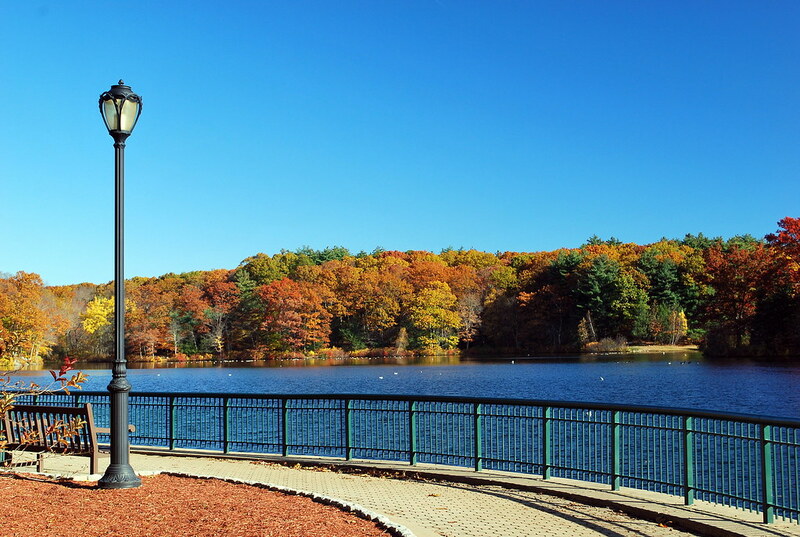 Before my adventures with the Taft Tunnel and a Providence & Worcester train this past Monday, I made a stop by Mohegan Park in the center of Norwich to see if there was any foliage left there to take pictures of. After the deluge of rain we'd had this past Saturday, I wasn't too sure what I was going to find left on the trees but I figured it was worth a stop to take a look around. My last trip to Mohegan Park was this past January when there was snow covering the ground and it was lot colder than it was Monday! The time before that was in November when all of the leaves had already hit the ground but I'd just gotten my Nikon D60 and was trying it out; the geese were very co-operative that day! 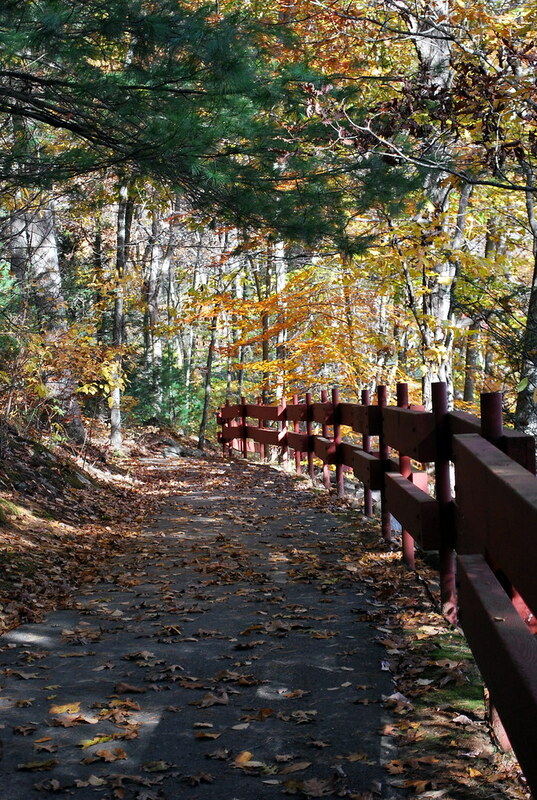 Mohegan Park is one of those "hidden jewels in your own backyard" kind of things like I mentioned in yesterday's post about The Quiet Corner and even though it's not that far away, I tend to not get there as often as I'd like. Of course, when I do get there, I seem to take pictures of the same things I've taken pictures of before! Regular readers will probably find these places to be very familiar! 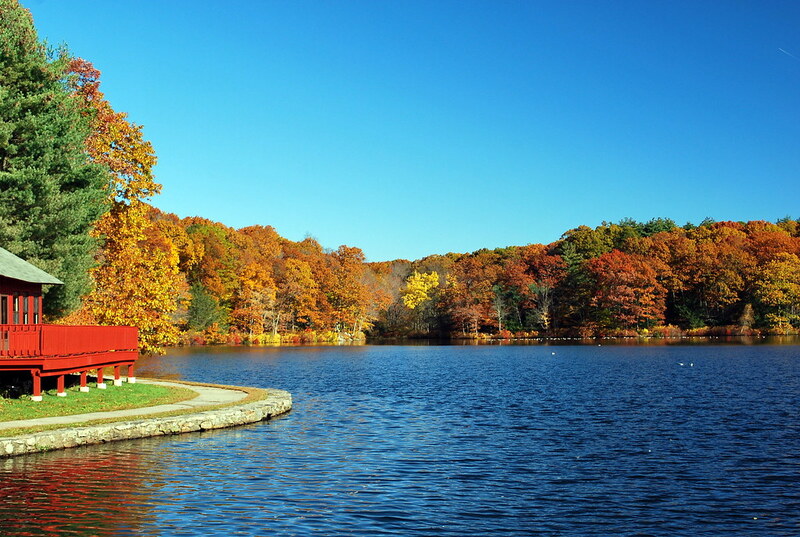 This is Spaulding Pond - obviously the centerpiece of Mohegan Park and very pretty. Off camera and to the right side of the picture, is a small swimming area that I used to take Michael to when he was little in the late 1980's and then the girls to on hot summer days in the late 1990's. As a matter of fact, I used to be taken there when I was little myself, probably in the mid-1960's, so it's obviously been there for quite some time! Years ago Mohegan Park had a zoo and a monkey cage and all sorts of stuff but all of those things are part of the past now. I seem to remember that there used to be a rollerskating rink of some sort either in the park or nearby but that's one of those memories that I just can't quite seem to grasp onto. Anyone out there remember what I'm talking about? We used to go there for Girl Scout outings long ago. 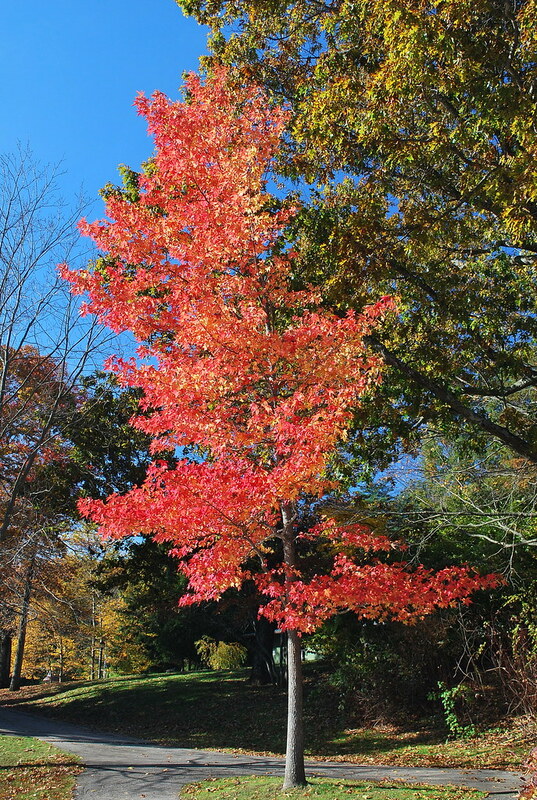 Even though there were a lot of trees that were bare this past Monday and there were an awful lot of leaves covering the paths, there were still a few trees that had reached what was probably their peak of color - like this one to the right. With a beautiful blue sky in the background, autumn doesn't get much better than this! 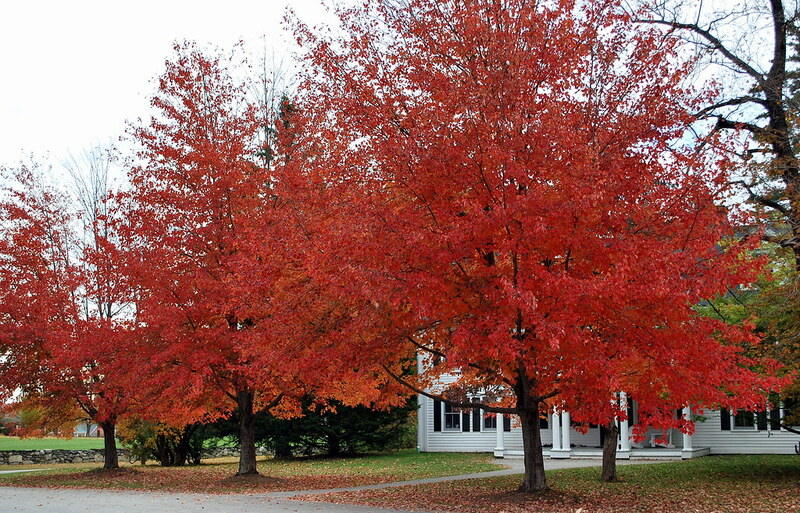 When I lived in California all those years ago, this was the time of the year that I missed the most in New England. Granted, you get some color in California (especially in the mountains) but I'm afraid it just doesn't hold a candle to what we here in New England probably take for granted most of the time. Living elsewhere, I've learned not to take it for granted at all and am probably driving you all crazy with so many foliage pictures lately! 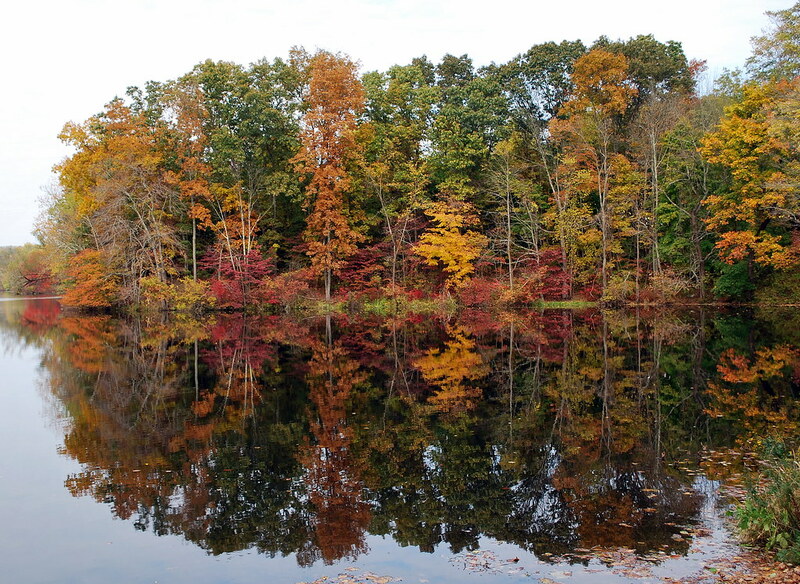 A friend of mine in the Air Force long, long ago once said that "Autumn is the blush of Mother Nature as she disrobes before Old Man Winter" and I've always remembered that as I think it describes the fall colors perfectly. 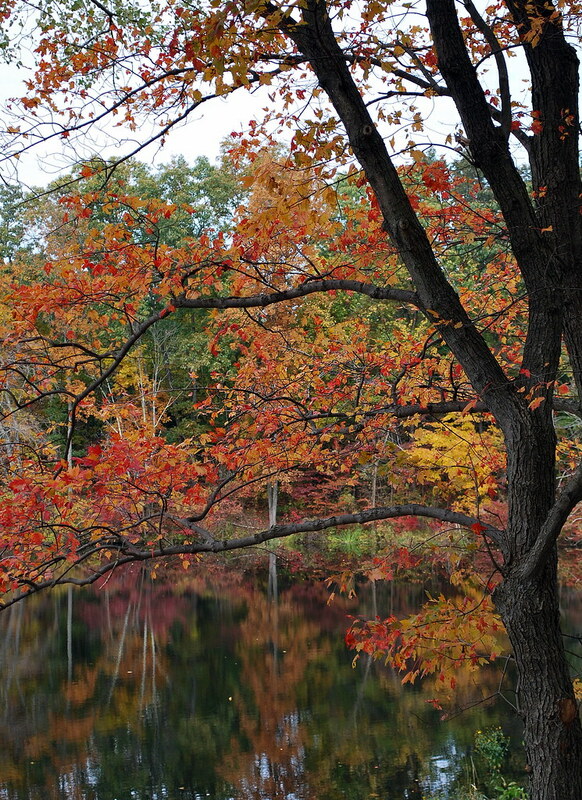 I'm glad I got the chance to head over to Mohegan Park on Monday as the rest of the week so far has been rainy and blah; I'm afraid that by the time the weather gets better again, there will be no leaves left on the trees and the autumn colors will just be memories or images caught on pictures. Speaking of images caught on pictures, I've got a few more posts to "blush" through in the next couple of days - I hope you won't mind! 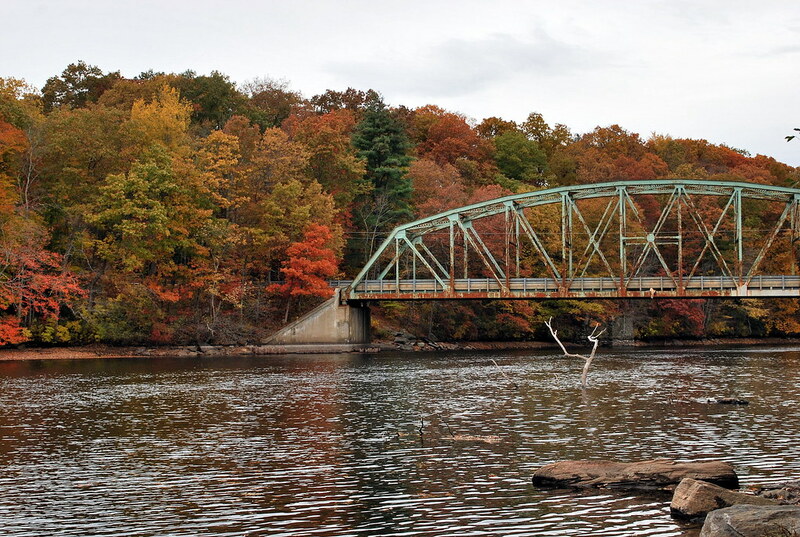 As mentioned previously, my cousin and I took a bit of a local road trip last Friday in search of foliage in the Quiet Corner of Connecticut. 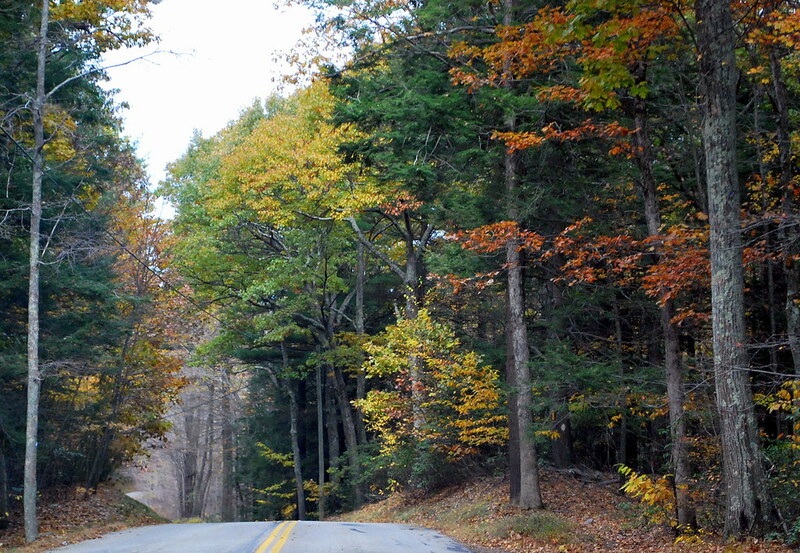 Sometimes when you're out traipsing around the rest of the countryside, it's all too easy to forget that there is beauty in one's own backyard - or in this case about 30 miles or so north of one's own backyard - and I was rather looking forward to exploring the back roads of the northeastern corner of the state in spite of the fact that it was somewhat overcast and darned cold for mid-October. On the bright side, though, it was my day off and it wasn't raining for a change! I asked my cousin to do the driving so that I could possibly take some pictures along the way and she graciously acquiesced so off we went in search of an apple orchard, some photo opportunities, and lunch! 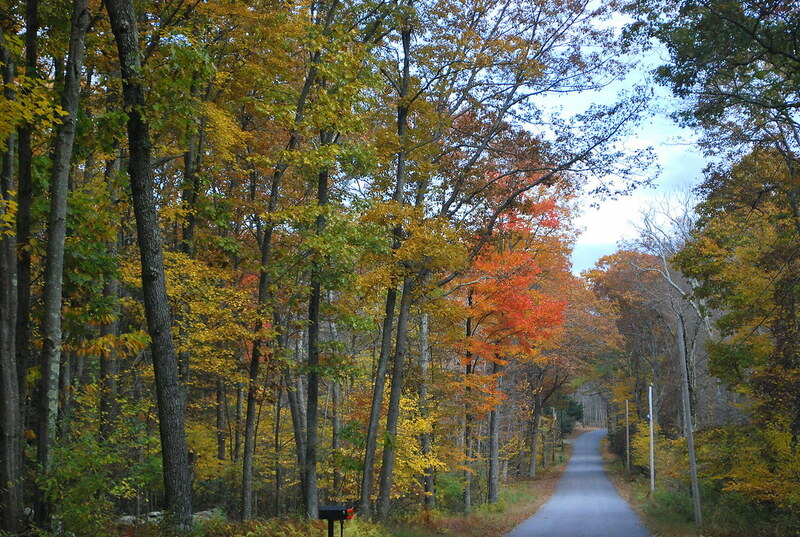 After plugging our destination in to the cousin's handy-dandy GPS unit, we drove up Route 169 to Route 44 and then over to Route 198 to Eastford and Buell's Orchard where I bought a nice bag of Cortland apples to make some pies, etc. I didn't really need that many apples and, as it was way too cold to even think about going out and picking our own, I didn't mind buying the pre-bagged ones in the least. A purist I'm not! From Buell's we made our way over to Route 171 and headed north towards Bigelow Hollow State Park, a place I had heard of but never been to. 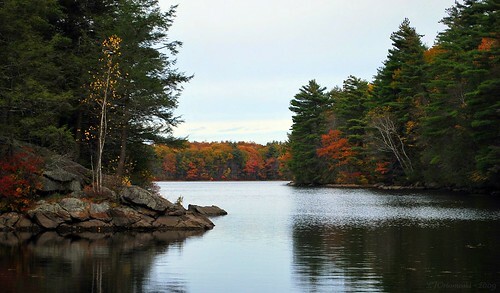 The picture above is Bigelow Pond not too far from the entrance of the park while the one below is Mashapaug Pond, located at the northern end of the park. 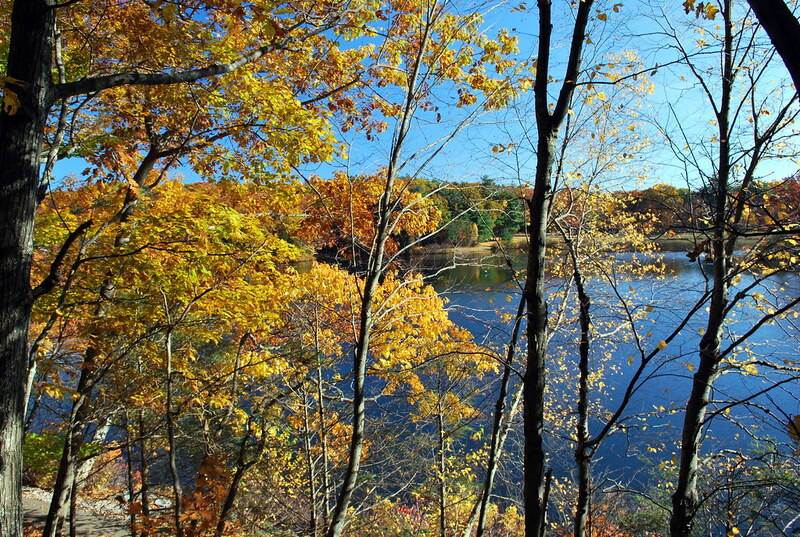 The name 'Mashapaug' is Nipmuck Indian for "Great Pond" so it seems kind of redundant to me that it's called Mashapaug Pond as technically that makes it "Great Pond Pond"! 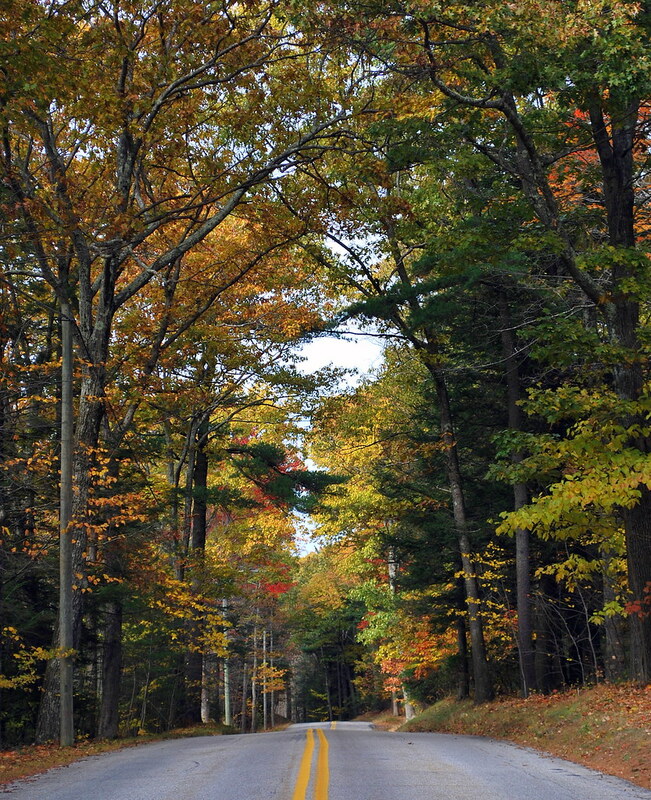 Bigelow Hollow is located in the Nipmuck Forest, one of the largest unbroken forest areas in Eastern Connecticut and the second oldest state forest with the first parcel being acquired in 1905. 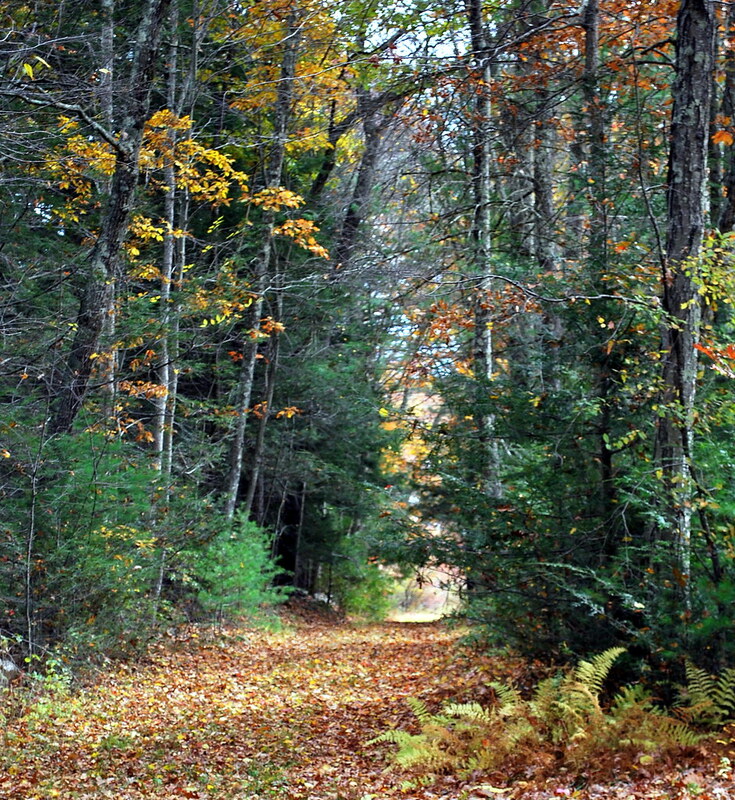 Bigelow Hollow and the Nipmuck Forest currently total over 9,000 acres and provide beautiful hiking trails as well as picnic areas. Not having a picnic lunch with us but definitely thinking it was well past time for some sustenance, we then headed up to Union - the smallest town in Connecticut - and the famous Traveler Restaurant (though truth be told, I had never heard of the place!). The thing that makes the Traveler unique is that in addition to a good meal, every diner at the Traveler can pick a free book from the many volumes that adorn the restaurant. Apparently the original owner came up with the idea back in 1984 as a way to thin out his own book collection and the current owners kept up the tradition. 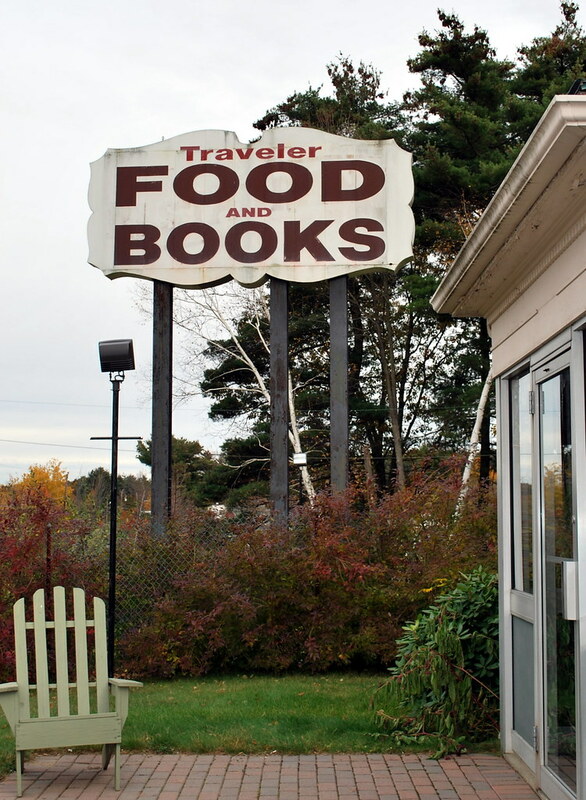 According to the back of the menu, the Traveler gives away approximately 100,000 books a year - books that have been donated by libraries or picked up at auctions or flea markets or even perhaps left on the front step. In the basement of the restaurant you can find The Book Cellar with approximately 20,000 used books that are for sale. All in all, it was the ideal place for my cousin the librarian to have lunch! Funny thing is, neither of us left with a book! Following lunch and a look through The Book Cellar we hit the road again and headed back down Route 171 towards South Woodstock. Along the way we made a brief stop at the small Union Cemetery so that I could take a couple of pictures. 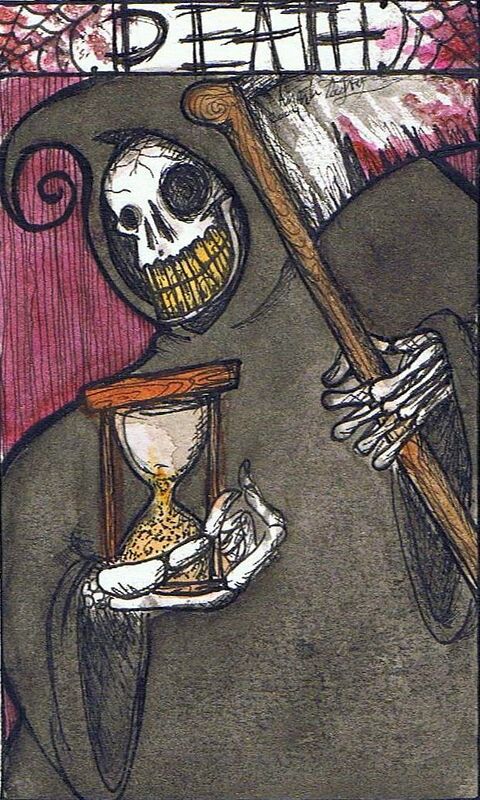 After all, you know me and cemeteries! The sun had managed to peek through a couple of times during the course of our day as you can see from the blue sky above the cemetery but it wasn't quite able to stay out for too long. 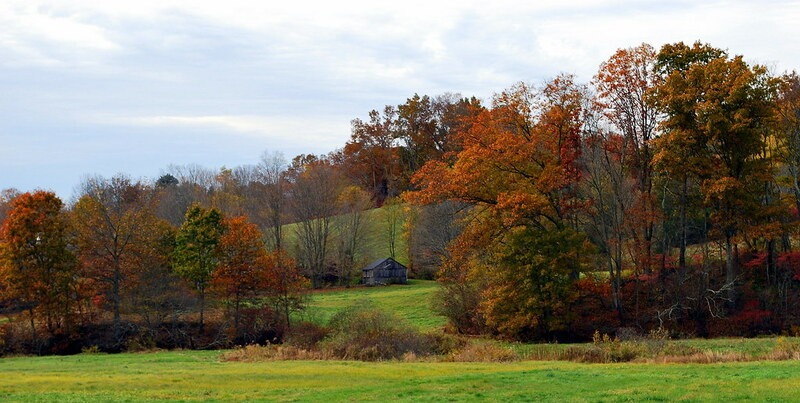 It was starting to get a bit overcast again as we turned from Route 171 onto Route 198 in Eastford and then cut across Old Colony Road to Schoolhouse Road where we stopped briefly to take the picture below. As I walked around trying to get the right angle and my cousin waited in the car, I was rather surprised when a gentleman in a pick-up truck slowed down to ask if we were okay and not having any car problems. I thought it was awful nice of him and it just goes to show that there is still kindness in strangers. It's sad that even living in a not-so-big city like Norwich I can get jaded to that fact. We drove around a bit more through Pomfret and Woodstock - home to such celebrities as Brian Dennehy, Renée Zellweger, and Carrol Spinney (think Big Bird and Oscar the Grouch) - but it just seemed to be getting cloudier and colder so even though I would have loved to have seen more of The Quiet Corner we decided to call it a day around 4:00 and made our way back down Route 169 to Canterbury. Honestly, though, there were some truly beautiful areas that I would love to explore further but one of the places that I don't think I'll be getting to is the abandoned settlement of Bara-Hack which is located in the woods of Pomfret and reputed to be haunted. 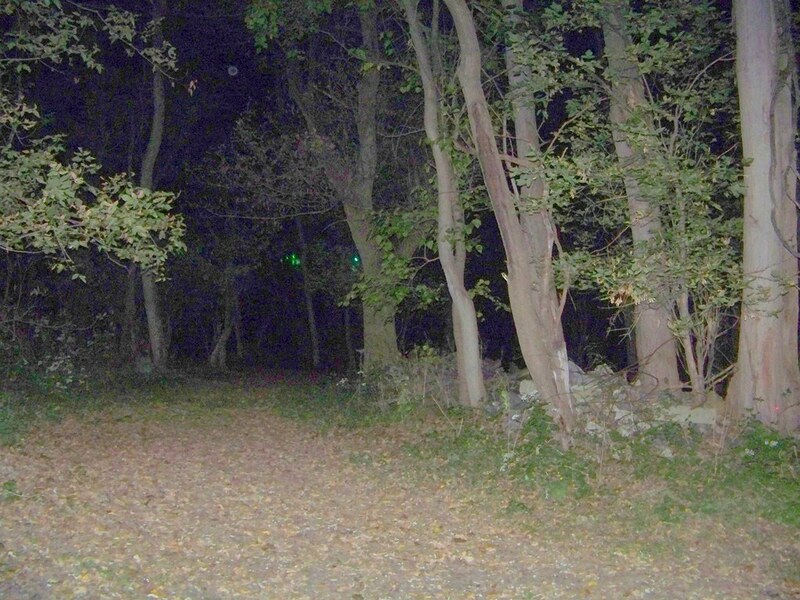 Sometimes referred to as "the village of ghostly voices", people have reported hearing children laughing, dogs barking, mothers calling, wagons rumbling, and other unexplained noises. The story goes that the area was first settled by two Welsh families back in 1790 but was abandoned after the Civil War for one reason or another. 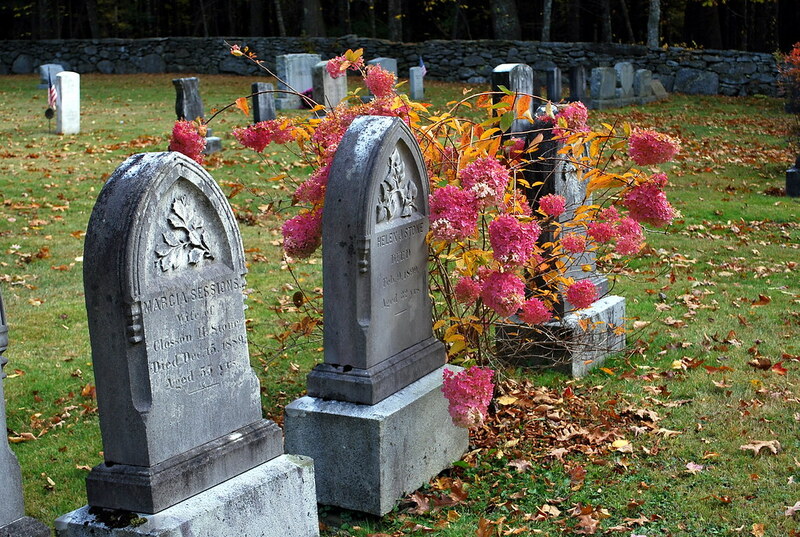 All that remains now are just stone foundations, cellar holes, and a graveyard in the woods. 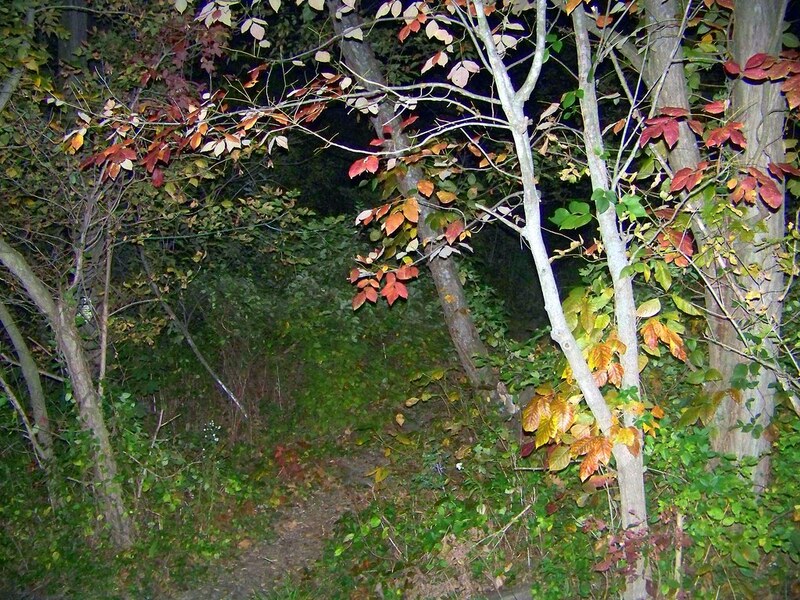 Even the official website has disappeared as the land is privately owned and the owners don't want a bunch of wanna-be-ghosthunters trespassing out in their woods. I can't say that I blame them and I sure the heck wouldn't want to go out there at night but I bet there'd be some cool pictures during the day of the ruins and such. Too bad the owners no longer give permission for people to be there, I'd like it just for the history. With that exception, though, don't be surprised if you end up reading more posts in the future from areas that aren't too far from my own backyard. 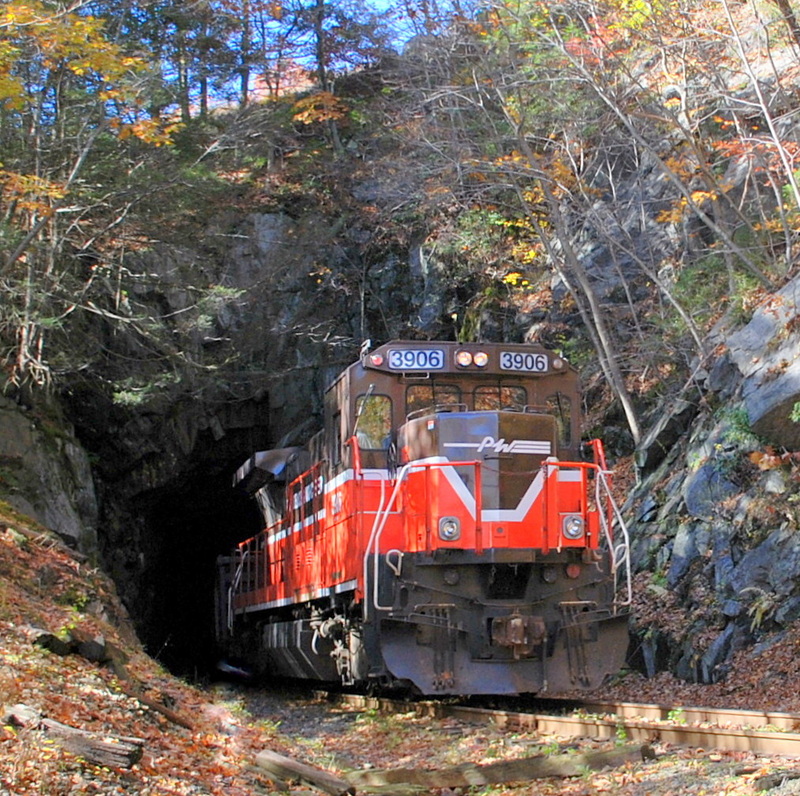 "The Lisbon railroad tunnel, which is officially named the Taft Tunnel, was originally built by the Norwich and Worcester Railroad in 1837. 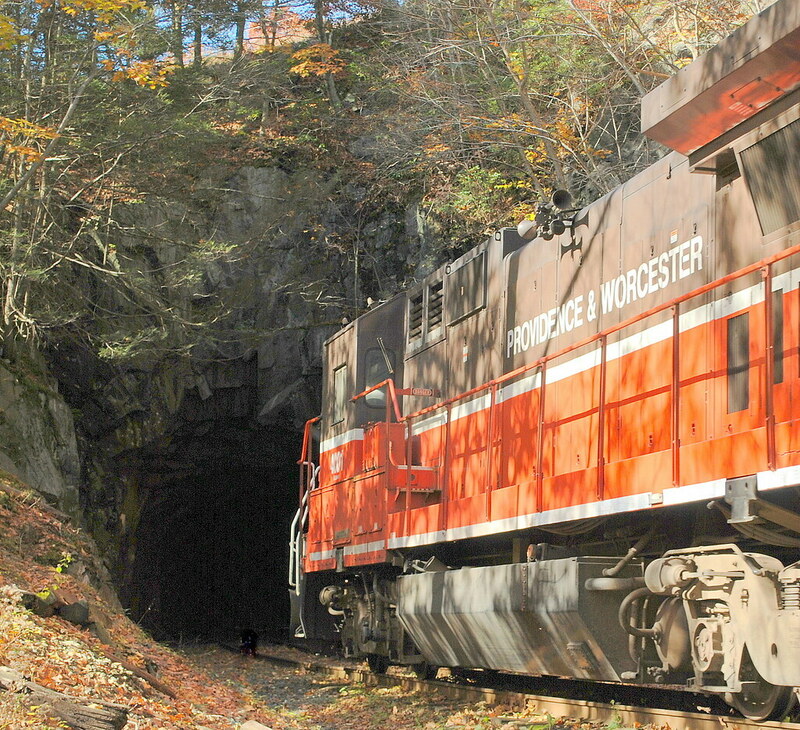 There is some debate as to whether or not it's actually the very first railroad tunnel in America but it is most definitely the oldest railroad tunnel in America still in use in its original form as the tunnel and tracks are still used by the Providence and Worcester Railroad." Ever since that first visit back in April, I'd been wanting to go back out to the tunnel and as yesterday was a beautiful autumn day with no rain in sight for a change, I decided it would be a good time to head back over. I wanted to see if maybe there was some good foliage to be found along the river near the tunnel and figured I didn't have too much more time before all the leaves were on the ground and the only foliage would be of the raking-and-bagging variety! 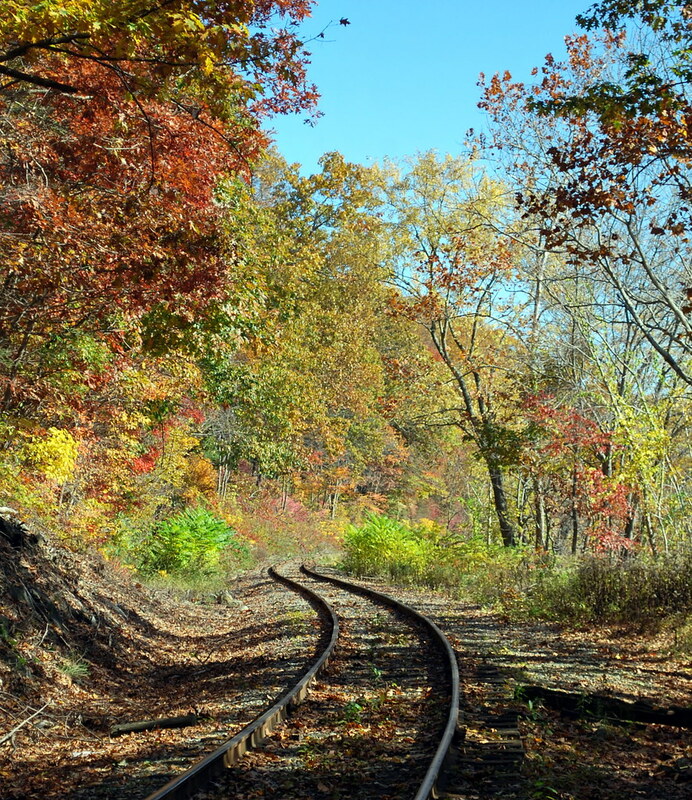 I parked by the side of Route 12, looked a little nervously at the "No Trespassing" sign, and after only a slight bit of hesitation began the short hike through the woods out to the railroad tracks. 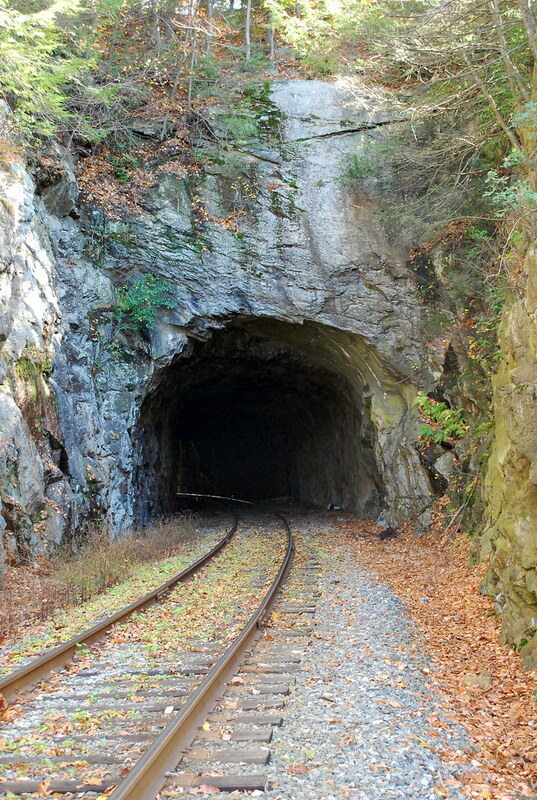 Once I got to the tracks I took a left and walked down to the tunnel, keeping an ear out for any approaching trains. The tunnel looked pretty much like it did when I last saw it in April - which is probably also pretty much like it looked in 1837! The only difference was that there wasn't a lot of standing water at the north end of the tunnel like there was back in April which meant I could walk the 300 feet to the other end and get some pictures there. With my friend Kevin's words of "you didn't walk all the way through last time because you were scared" ringing in my head - along with what I'm pretty sure was the sound of my heartbeat ringing through my ears - I started through the tunnel while all the time really, really, really hoping that a train wasn't going to pick that time to come down the tracks. 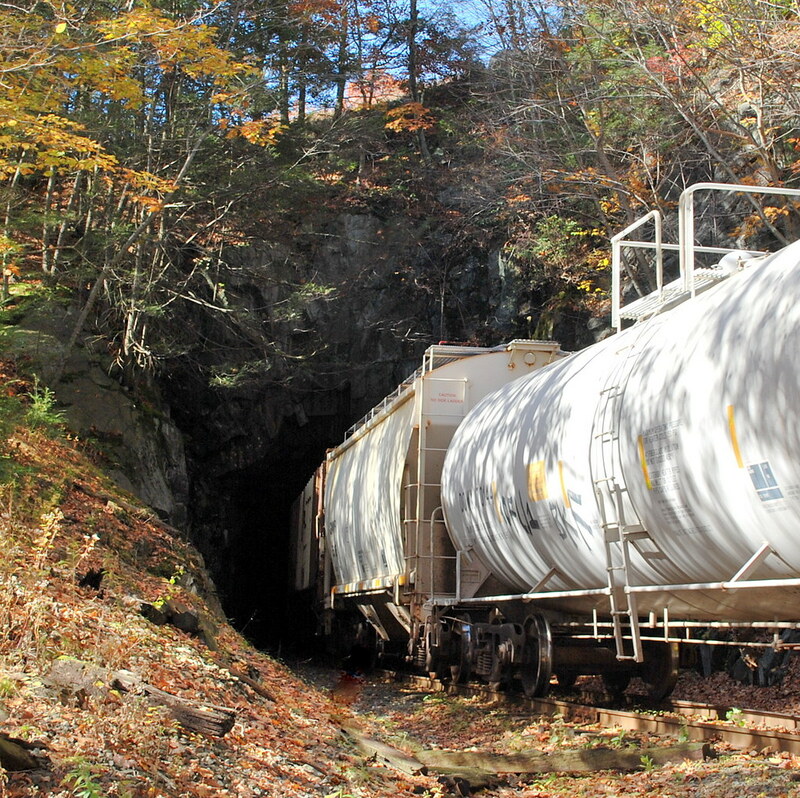 Even though the tunnel is 23 feet wide, I didn't relish the thought of pressing myself against the side of the rock wall in abject terror while a train rumbled past. 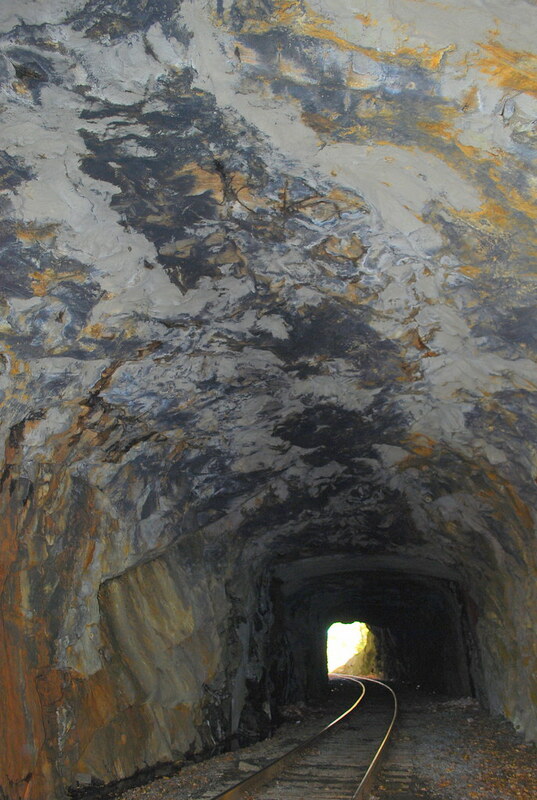 As I got closer to the north end, the floor of the tunnel got mushier and some of the railroad ties were loose beneath my feet but I made it all the way through to the other side just in time to hear a rumbling that I knew was not coming from the river. Oh good Lord, a train was coming! 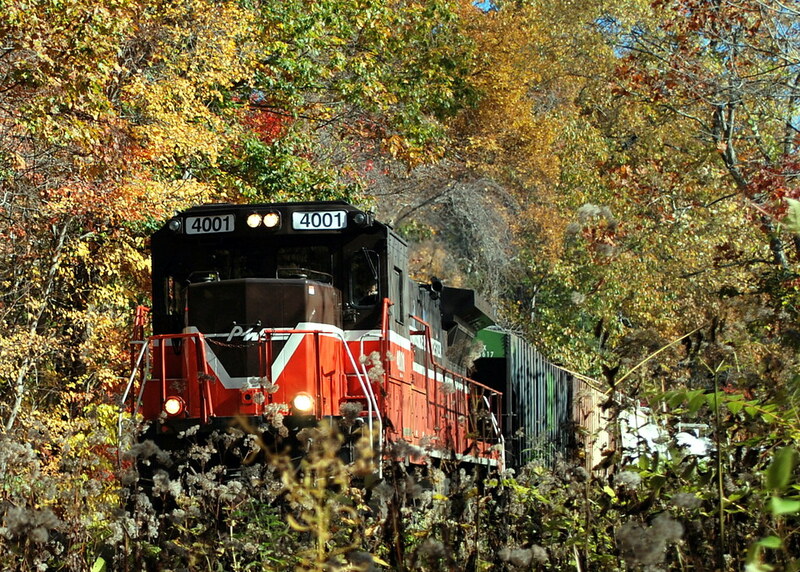 I quickly found a small area less than ten feet from the tracks that looked like the best place to be out of the way and sat down on a small rock just in time to see Engine 4001 come around the bend. Now let me tell you, I like trains and I've taken more than a few pictures of them in the past but sitting less than 10 feet away from one by the side of the tracks is a bit - shall we say - disconcerting. If I'd thought my heart was beating in my ears earlier, that was nothing compared to the noise I was hearing now! Luckily I remembered to take a couple of pictures of the train entering the tunnel though I wasn't sure how well they were going to turn out as I felt like I was shaking so bad! Finally the end of the train came into view - another engine moving backwards rather than a caboose as I guess trains just don't do cabooses anymore - or at least the Providence & Worcester trains don't seem to. After the engine disappeared through the tunnel and the ground stopped shaking and the rumbling faded away, I shakily got to my feet and alternately thanked God many times over that I hadn't still been in the tunnel when the train came through while telling myself I was too old for this sort of thing! Still, I couldn't wait to tell Kevin the story later at work; he's a major railroad fan so I knew he'd appreciate the tale as well as maybe be a little jealous! 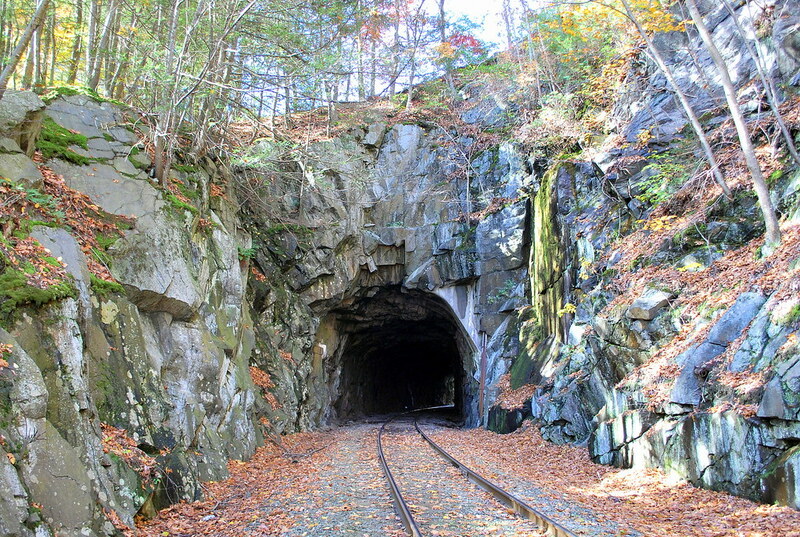 After taking a couple pictures of the north entry of the tunnel I began my trek back through to the other side a lot more relaxed than I was when I went through the first time as I was quite confident that another train wouldn't be coming through anytime soon. I didn't linger too long, though, just in case one of the engineers had spotted me by the side of the tracks and decided to call in some form of law enforcement. I wouldn't have been at all surprised to have come out of the woods and found a State Trooper waiting for me by my car but luckily that wasn't the case - whew! As I sat in the car for a few moments before turning towards home, the blogger in me kicked in as I thought "This is going to make a great post! I hope the pictures came out okay!" All in all, I'd have to say that yesterday's trip to the Taft Tunnel was quite the adventure but I honestly don't think I'm going to be doing that again anytime soon - no matter how pretty the foliage on the north side ended up being! 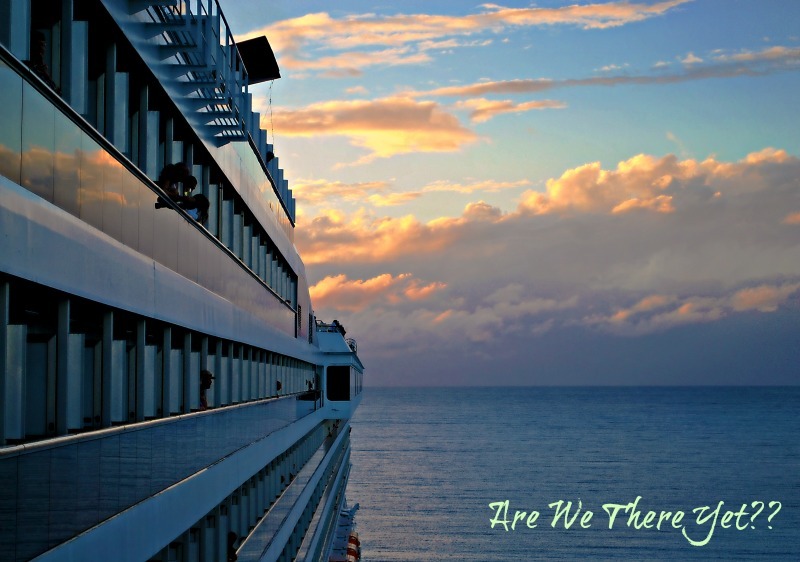 Unless, of course someone else wants to go with me next time! For my trip to the Gettysburg National Battlefield Park, please visit The Distracted Wanderer for the original post. Thank you! 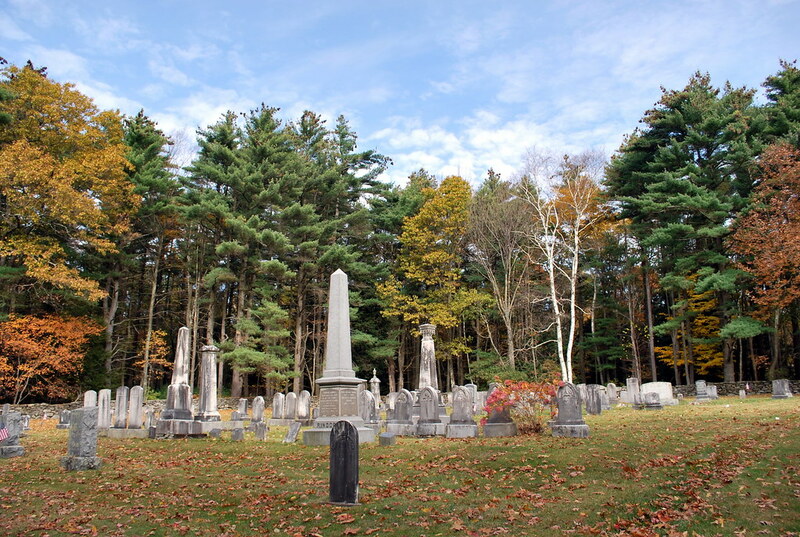 Plans for my day off yesterday included an excursion with my cousin Amy to parts of the "Quiet Corner" of Connecticut, or "The Last Green Valley" as it has also been called, in search of some foliage pictures. 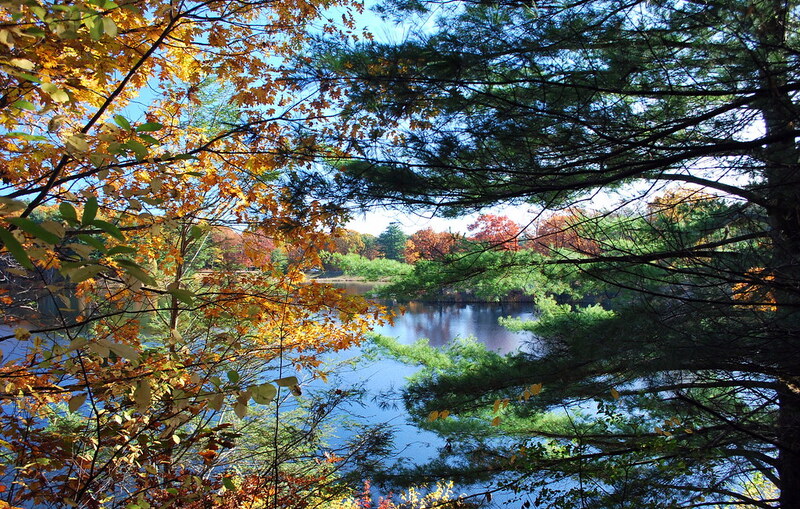 The area - over 1,080 square miles - lies within a Congressionally designated National Heritage Corridor along the Quinebaug and Shetucket Rivers and represents the remaining substantial greenbelt within the urban and suburban sprawl between Washington and Boston. I had my fingers crossed that the weather was going to be nice for a change but alas, it was pretty darned chilly, windy, and overcast for most of the day though the sun did try to poke its head out a time or two while we were driving the back roads of Woodstock, Eastford, and Union. Before we got that far, though, I made a brief stop on my way to my cousin's house for some pictures along the banks of the Quinebaug River in Canterbury near Butts Bridge. 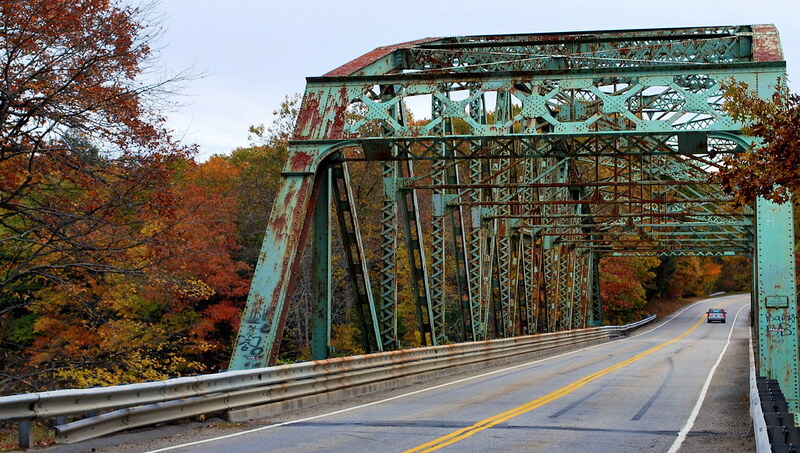 The current Butts Bridge was built in 1937 following several other bridges that had been built near the same spot starting way back in 1728 by two gentlemen from Plainfield, Canterbury's neighboring town to the east. That bridge was swept away in a freshet (a sudden overflow of a stream resulting from a heavy rain or a thaw) and in 1733 another bridge was built in the same place by Samuel Butts, a Canterbury resident. 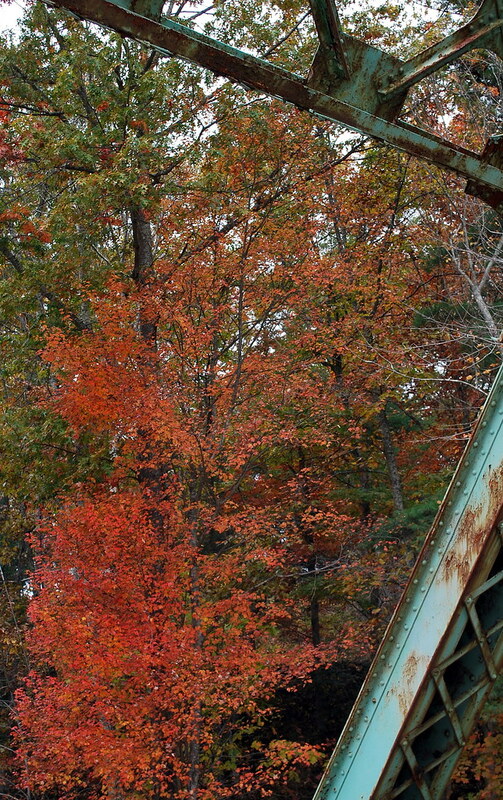 Several years later, that bridge was swept away by ice. A third bridge was built in the same spot but it, too, was damaged in the Great Flood of 1867. In the picure above you can see a bit of the old abutments that are still standing just north of the current bridge. 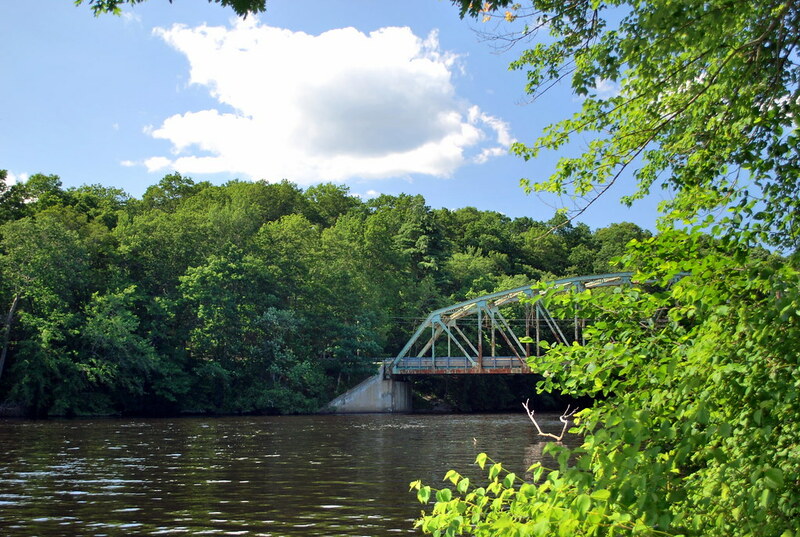 For all that the Quinebaug doesn't look like a mighty river, it has certainly done more than its fair share of damage and claimed a good number of lives over the years, too. Despite the fact that we have had rain hand-over-fist this year, the waters of the Quinebaug are currently very low. When I took these pictures yesterday, I was standing along a bank that had been underwater in July when I took pictures in the same area. Click here for one of those pictures if you'd like to see the difference. Butts Bridge was last renovated in 1988 and even though it looks like it could use a new coat of paint, I kind of like the rusted areas - it seems to add more character to what could be considered a rather ordinary bridge if one didn't have a slight inkling of what it took for a bridge to finally withstand the waters of the Quinebaug River in this area. Even though I'm still working on my Gettysburg post (heard that one before, right? ), I'll try to get some pictures of our drive yesterday posted soon, too. 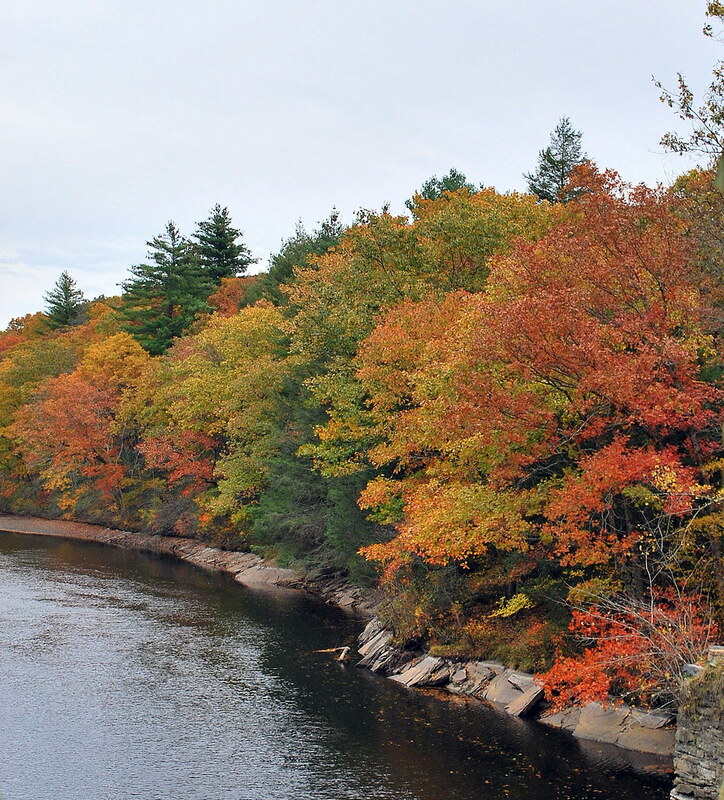 After all, just because you aren't in New England doens't mean you can't enjoy some of the New England foliage, right?!? Fridays are skies day and that works out great when I'm juggling time and not doing such a great job which is truly the case today! Still, I've got a day off and I'm going to try to make the best of it and that does not include sitting home on the computer! So what better than a nice quick post courtesy of a nice meme by one of my nice blogging friends? 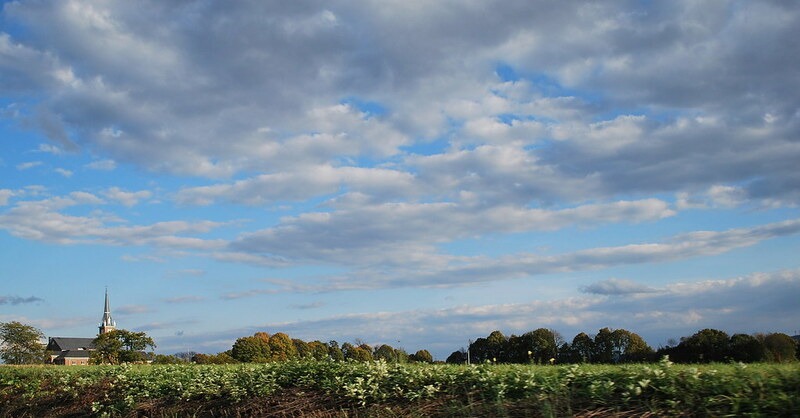 Tisha's Looking at the Sky on Friday is a great way to share some of our skyward photos like this picture that Amanda took outside of Kutztown, Pennsylvania last Tuesday while we were driving from the Dutch Country up to visit Mark & Lisa. Despite the clouds, it sure was pretty! Here's wishing everyone a very pretty Friday wherever you are and whatever you're doing. As for me - I'm going to pick some apples, take some pictures, and hang out with my cousin. Sounds pretty good to me! Yesterday morning was my once-a-month get-together with my friend Rhonda and after a lovely breakfast full of catching up and coffee, I figured I had just enough time before work to try to hunt down a little foliage in the area before Mother Nature decides to wash it all away in the predicted rains for this weekend (yet again). She hasn't exactly been playing nice this year what with the winter that never ended, the summer that never was, and a fall that seems more like that winter that never ended but there are still a few nice spots around for some patented New England fall color. 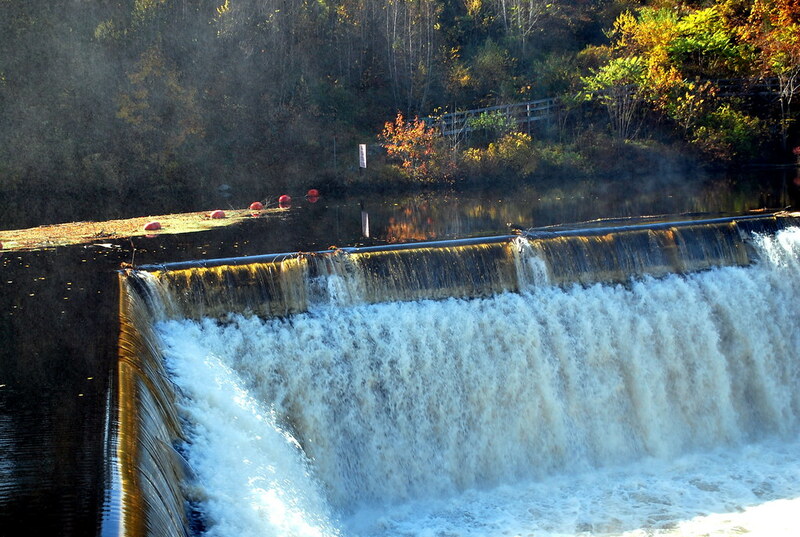 These two shots were both taken on the Versailles side of the Shetucket River just on the other side of the Occum Dam. The way I look at it, if you can manage to catch the reflection of the trees in the water then you get double the goodness with foliage! I'll be working my usual double-shift today but am hoping to get a few more pictures on Friday when I've got a day off as it's not supposed to start raining until later in the evening - I hope! My very own residential Mistress of the Macabre has come up with a lovely little Halloween-style drawing that I decided was perfect filler while I'm still putting together my pictures from Gettysburg! What with the new blog look, it seems like an excellent fit! Oh, and lest I forget Amanda has moved her own blog and can now be located at Inside the Mind of Delirium. She doesn't post too often but occasionally she throws some of her artwork up over there. I apologize in advance for her occasional use of an expletive should you go by - seems to be a teenage thing these days which is even worse if you happen to follow any teenagers on Twitter and some of their Tweets. Those seven words that George Carlin used to talk about ain't nuthin' anymore I'm afraid! 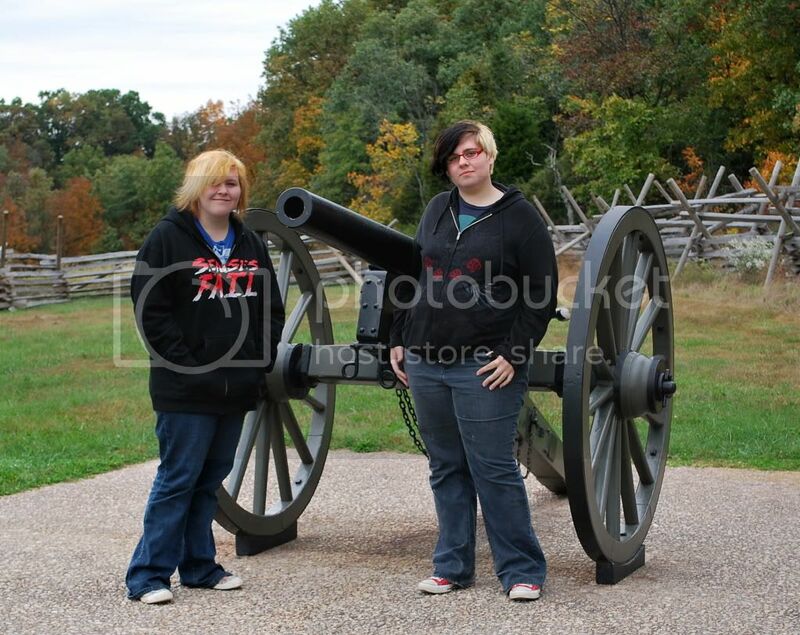 I had hoped to have my post about the day the girls and I spent touring the Gettysburg National Battlefield ready to go for today but alas, I've still got about 170 more pictures to edit and cull through before I finally can start working on the post itself. Yeah, yeah - I know, I take WAY too many pictures! This second one is Amanda and I on top of the monument for the 12th New York Regiment located on Little Round Top overlooking The Valley of Death. 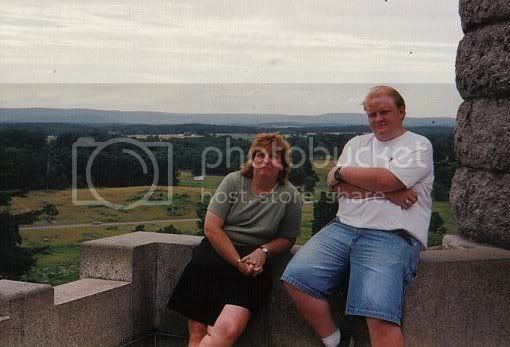 I wanted to have a picture taken there as my son Michael and I had our picture taken on the same monument when we visited Gettysburg in 1999. Gee, what a difference ten years makes - at least for my hair - but the sky looks rather the same, doesn't it? I hope I don't have to wait another ten years to have a picture taken there with Jamie one of these days! Following the completion of Edgar Allan Poe's funeral service (featured in the post below) on Sunday evening, the girls and I headed northwest to Pennsylvania and Gettysburg - one of my very favorite places in the country. 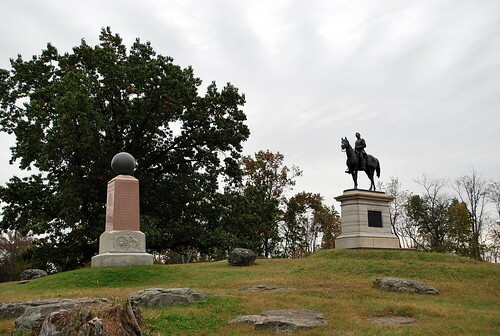 I've been to Gettysburg several times in the past (the first time being back in the late 1970's when I was stationed at McGuire Air Force Base in New Jersey) and each and every time it has fascinated and awed me. There's really no good way to describe the feeling I have at the National Battlefield and the area surrounding it and I wanted to share that with Amanda and Darci in the hopes that perhaps they, too, would come to understand and appreciate some of the struggles our country has gone through to become the Nation that it is. I honestly don't believe that there is a more hallowed ground anywhere despite the fact that Gettysburg - sadly - is not anywhere near the only battlefield in this country. 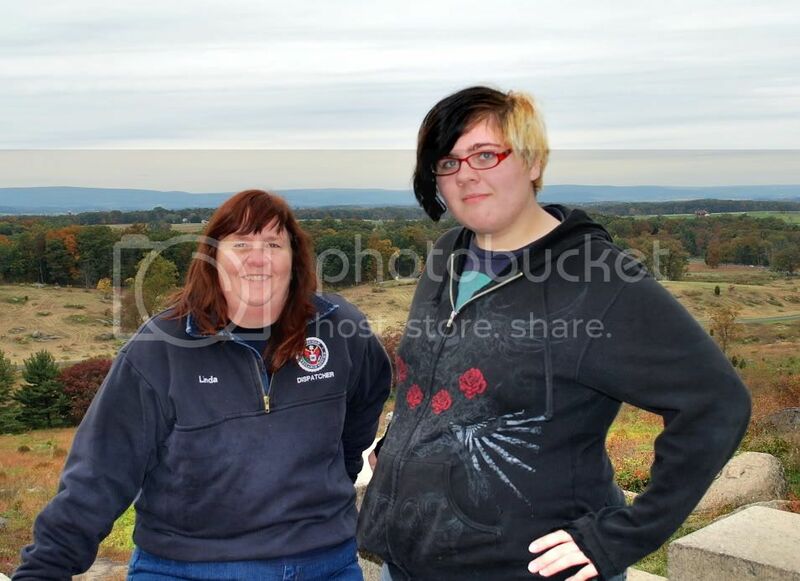 The last time I was at Gettysburg was with my cousin Amy back in May of 2002 and the time before that she and I had gone down with my son, Michael, shortly after he had graduated from high school. Initially Michael had that typical teenage are-you-kidding-me kind of attitude but that changed after we were there for awhile. Consequently this wasn't my first journey to Gettysburg with teenagers in tow and I was hoping that my previous experience would help out if they got to the are-you-kidding-me stage. As Poe's funeral ended up running almost 2-1/2 hours, it was pitch black by the time we arrived in Gettysburg after 8:00 so consequently the girls had no idea what the countryside around us looked like. We drove through town and out to our hotel - the Quality Inn that is on the site of General Lee's former headquarters across from the Lutheran Theological Seminary - site of the first of the three days' fighting in Gettysburg. I'd always wanted to stay there and it was a lovely hotel (probably the best one of our whole trip). After checking out the room and putting our stuff away, we drove to the Pizza Hut just down the road a bit and fortified ourselves with stuffed crust pizza before moving on to the rest of our agenda for the night - a ghost hunt with a blogging buddy of mine from Virginia! This is Patty and she writes the blog Autumn's Meadow as well as A Haunting We Will Go. 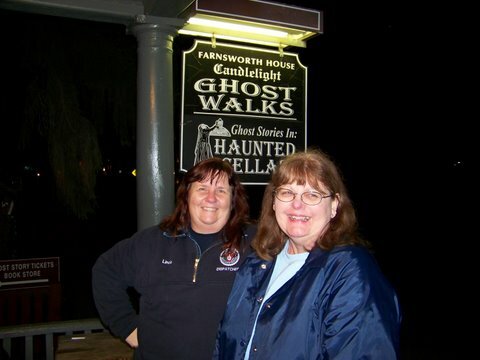 I knew from reading her blog that Patty had planned to be in Gettysburg in October with her husband Dean and I was lucky that it turned out to be the same time that the girls and I were going to be there. Patty is an amateur ghost-hunter so I knew I'd finally be able to go on one of the many ghost tours that Gettysburg is famous for. There is no way on God's green earth that my cousin Amy would ever go on one with me when we were there but it was something I had always wanted to do. The girls were pretty excited about it, too, as the walk that we were going on was touted as an actual ghost hunt with actual ghost hunting equipment like night vision sensors, infrared viewers, thermal sensor digital recorders, EVP meters, and that sort of stuff. We weren't just going to walk around and be told scary stories - we were going in search of some ghosts! 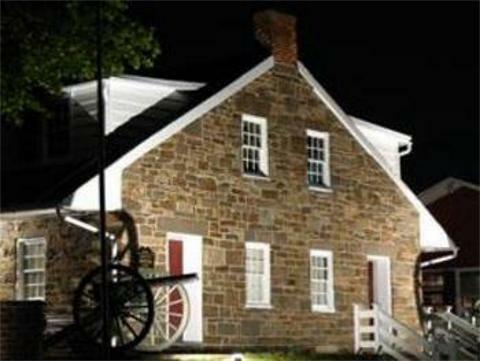 After checking in at the Farnsworth House, one of the more famous spots for ghost tours in Gettysburg, we gathered out front with about 15 other people waiting for our guide, Gwen, to finish guzzling half a bottle of Coke before we headed out into the night. Apparently she'd had a long day and was in desperate need of caffeine which then gave her a desperate case of the giggles. The girls liked Gwen but I thought she was kind of a ditz and could have done a better job explaining to us how the equipment worked. Thankfully Patty and Dean had a pretty good idea of the technology involved so after being divided into groups, off we went in search of some of the supernatural. The area that we were taken to is known as The Grove, one of the most haunted areas on the battlefield which is located on the northernmost territory of Cemetery Ridge. Gwen gave us a brief run-down of what transpired during the fighting in the area on the second day of battle involving the Louisiana Fighting Tigers who had a reputation as being some of the fiercest, hardest-fighting, assault troops in General Lee's army. She pointed out what spots would be best for our hunt then plunked herself down on a rock to smoke cigarettes while we wandered around in the dark being careful not to trip over dark roots or any of the walnuts lying around! While everyone else in our tour group headed out across the school fields towards a lake behind the trees underneath which bodies supposedly lie; Dean, Patty, Darci, Amanda, and I headed towards the woods at the foot of Cemetery Ridge. 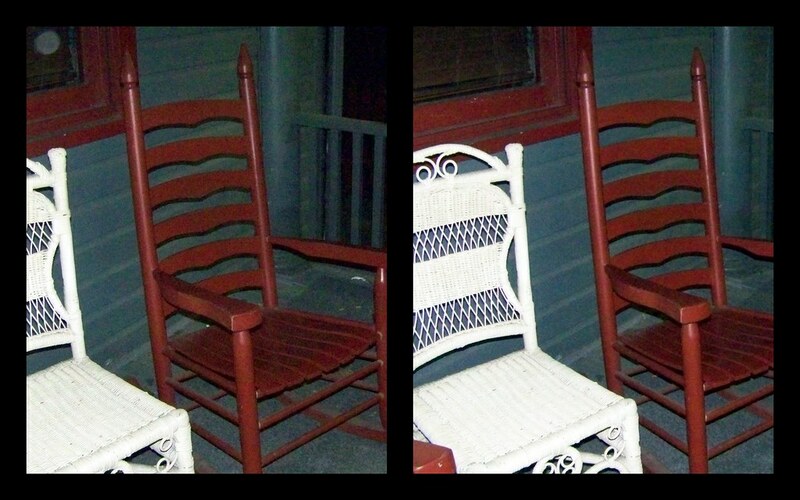 While everyone else tried out the high-tech equipment, I took a camera and just started snapping pictures in the dark to see if I captured any interesting orbs or the like. Generally speaking, you've got no idea what you may or may not have gotten in the picture until you get the chance to upload them to a computer. 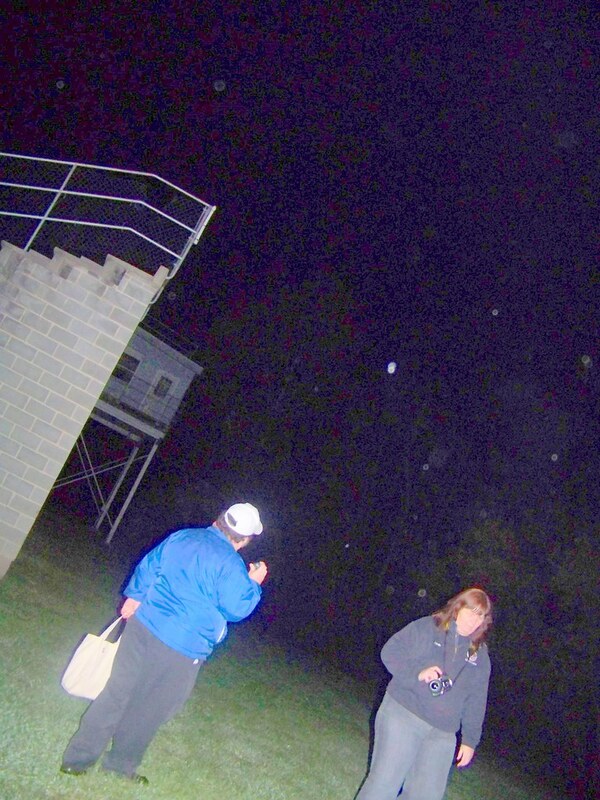 In the shot above, if you look carefully you can see a small orb in the left corner in a small patch of night sky. It looks solid enough to be an actual orb and not a bit of dust (which produces orbs that are generally translucent). Also, it was close to midnight and as it was pretty cold and damp, I don't think there was a whole lot of dust flying around out there. I could be wrong, of course! 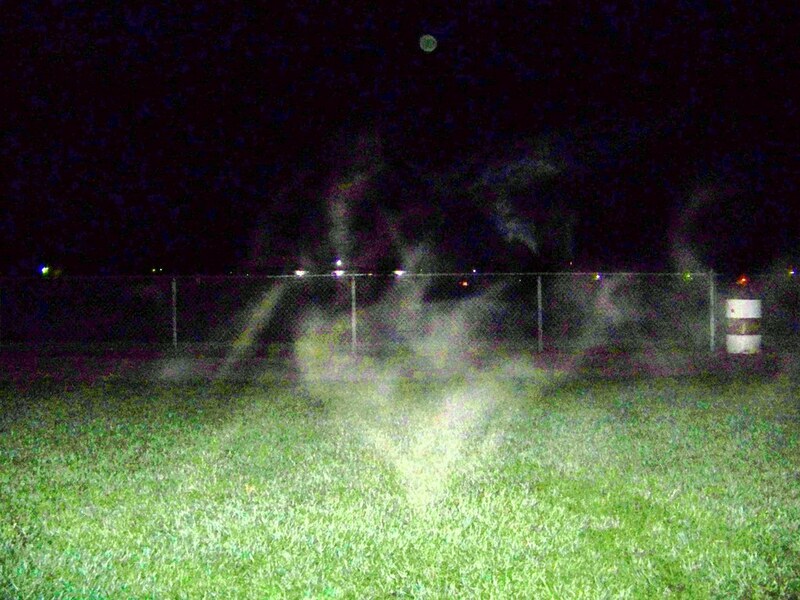 We never did get over to the lake where everyone else was still hunting around but in an area just east of the bleachers, Amanda got the following picture of what looks like some sort of mist forming right in front of her as well as an orb at the top. I should point out that Gwen had told us to take pictures in groups of three and in the other two shots that Amanda took of this same area, there wasn't even a smudge. This one you could see while it was still in the camera, too, so there was no waiting to get back to upload the pictures. I was walking right next to Amanda when she took this and I can vouch for the fact that there was nothing there at the time that I could see with my naked eye - no breath condensation, no one walking in front of her - nothing. In this picture, Dean and I were walking back across the field towards the rocks where Gwen was sitting and Amanda decided to snap a couple pictures. For some reason she really likes strange angles - well, either that or it was too dark for her to see where she had the camera pointed! I'm not sure whether Dean and I are walking through a field of dust or a group of orbs but either way I thought it was interesting and it looks like there might be one or two "legitimate" orbs floating around. I do remember feeling like "wow, it just got really cold" when we were walking back and a slight sense of unease so maybe this explains why. Following our "hunt" we all gathered back together and walked back to the Farnsworth House were Gwen offered to come back out and talk to people after she had changed into her street clothes if they were so inclined. Both Amanda and Darci wanted to stay so even though it was way past midnight and getting chilly, we all hung around for a bit to chat. 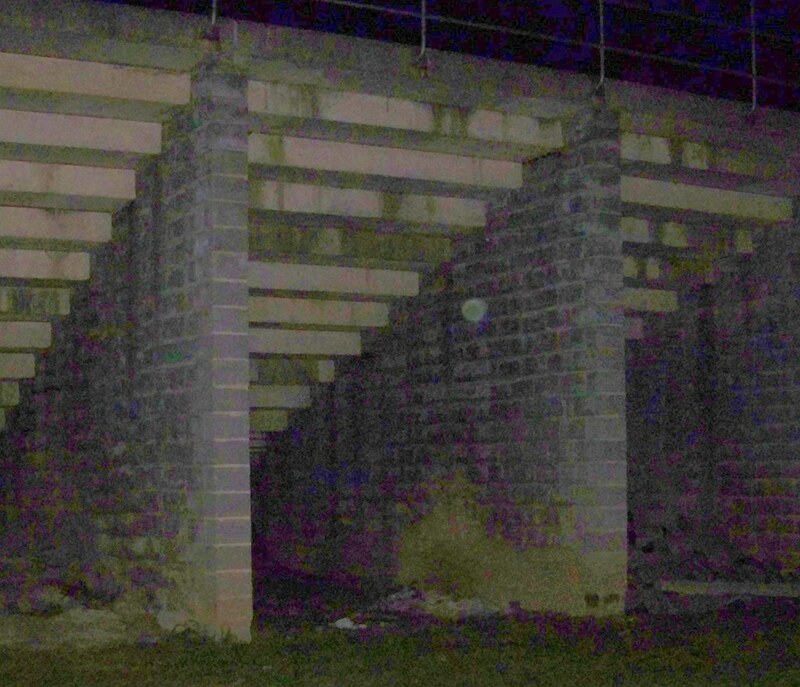 So, was our ghost-hunting adventure a success or a flop? If a success means that we got some 'strange' things on pictures, felt some 'strange' things, and even caught the occasional whiff of pipe tobacco and the like then I'd say that "yes, it was". Also, considering that both girls had a really good time and had to be dragged back to the hotel at 1:30 in the morning then yes, it was definitely a success! I wish we'd had more time to spend with Patty and Dean but Monday was going to be a whirlwind tour of the battlefield for the girls and I before heading to Lancaster that evening to put Darci on a train to Philadelphia and Patty and Dean had plans of their own. However, I've told Patty that we definitely need to meet again and do some more exploring of the area - next time without an overly-caffeinated, bubblehead of a tour guide who spent more time giggling than anything else. The National Battlefield doesn't close until 10:00 at night so perhaps we can head out to the Valley of Death and a haunting we will go!